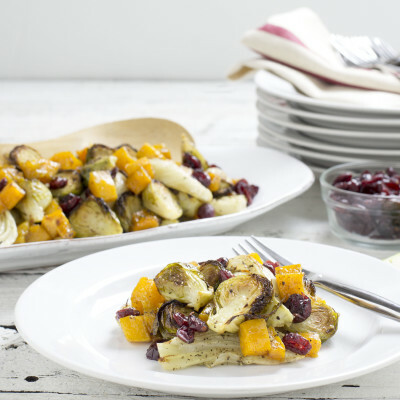 Classic fall flavors combine to make a delicious and beautiful side dish, perfect for holiday entertaining. Line two baking sheets with foil and lightly grease them each with olive oil. Slice the Brussels sprouts in half and place them in a large bowl. TIP: Keep it simple by using Brussels sprouts that have already been cleaned and cut in half. Cut the anise into quarters, removing the base leaving just enough intact to hold the quarters together. Cut the quarters into 3/4 inch wedges. Add the anise to the bowl with the Brussels sprouts. Add 2 tablespoons olive oil and ½ teaspoon of salt to the bowl. Toss lightly to coat. Place the Brussels sprouts face down in a single layer on one of the baking sheets and fill in the spaces with the anise. Bake until lightly browned (about 20 minutes). Remove the pan and turn over the Brussels sprouts and anise for even browning. Return to the oven and cook for another 5-10 minutes or until evenly browned. Cut the squash into 1 inch cubes. Place the cubes in a large bowl. Add 1 tablespoon olive oil, honey, ½ teaspoon of salt, and cinnamon. Toss lightly to coat. Add the cubes to the other baking sheet in a single layer. Bake for 20-25 minutes or until softened and lightly browned, turning once at 15 minutes. NOTE: Both pans can be roasted at the same time on separate racks in the oven. Remove both pans and add ingredients to a large bowl or serving dish with dried cranberries. Add freshly ground pepper to taste. Taste for salt and adjust as necessary. Toss lightly to fully combine. Serve warm.